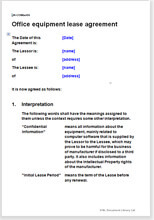 This template records the terms of a lease of office equipment to a business. The agreement suits all types of equipment, from small portable items such as mobile phones or laptops, to large, less easily moved items such as office furniture to air conditioning equipment. The lease could be for a long or short fixed term or on a rolling basis. We include the option for purchase of the equipment after a certain time, i.e. you can edit it to be a finance lease or an operating lease. This equipment lease agreement is a comprehensive and flexible document suitable for any term and any equipment. It covers every reasonable angle, providing both a statement of the commercial terms and a very firm basis of rights of both parties. This lease principally protects the lessor of the equipment but fairly treats the lessee. Since this agreement does not take account of the consumer credit and other consumer protection law, it can only be used to lease equipment to a business (and not to the general public). one company within a group of companies leasing to another company in the group. The advantage of not taking account of consumer protection law is that you are free to make the deal you want without having to look over your shoulder at government regulations (although, of course, there is a raft of legislation about operation of almost any equipment). To make your life easy, we have provided multiple options in many areas including responsibilities for maintenance, payment of the lease rent, options for buy-out at the end of lease, options to extend the lease and much more. This office equipment lease agreement is extremely comprehensive and written in plain English. It has been drawn for maximum flexibility and ease of use. Segregation of legal wording from the commercial terms. This keeps the "legal" wording of the commercial transaction separate to the "subject matter", creating an agreement that is easier to read, amend and reuse. The rent might be a simple monthly or annual payment or may be variable. The buy-back arrangement is an option you can include or delete. We have other templates for leasing hardware and equipment. For items that would not be classed as office equipment, our equipment hire agreement might be more suitable. For plant and larger machines, see our Machine lease agreement: any industry, any machine. A road vehicle: use our Vehicle lease agreement.